From a quick glance at my Instagram you'll see that I wear some sort of slogan tee/jumper almost everyday, I love them. It's gotten to the stage where every time I go shopping I almost always pick up something with a slogan on it. 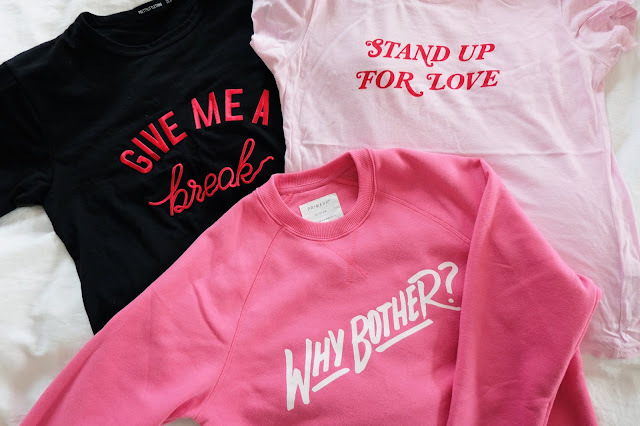 I love being able to wear some sort of sassy message and they definitely liven up an otherwise plain outfit, so today I've decided to write an ode to the slogan tee and share some of my current favourites with you! Another great thing about the slogan tee is that they're so easy to style. You can chuck one on with a pair of jeans and a biker jacket or denim jacket and you're good to go. I love that comfy/casual style and having a slogan printed on my t-shirt just adds something to it. They're also a fantastic way of adding some colour to an outfit too. A lot of the time I'll wear a pair of black jeans and a denim jacket or a grey biker jacket and wear a pink or red slogan t-shirt and it looks way better than a plain t-shirt would. They've become such a style staple recently so lucky for us slogan lovers most shops have a whole array of tees and sweatshirts to choose from. Below are just a few of my favourite slogan t-shirts at the moment. If any take your fancy you can just click on the picture to be brought to the actual item, and yes, I will take full responsibility for you buying yet another slogan tee! A little tip I would give anyone who's also a lover of anything slogan printed like myself would be to check the men's section as sometimes they have the best stuff. The slogan sweatshirt in the main image of this post is actually from the men's section in Penneys and it was only €8! Have you bought any slogan tees recently? I'm always on the look out for new ones to add to my every expanding collection so let me know, because after all sharing is caring!